I think I'm starting to get into the swing of things with this project now. I'm drawing more regularly and starting to push myself into learning skills I weren't expecting. Over the last two weeks, I've found myself becoming more keen to try producing more realistic work, derived from real source material. I seem to be gravitating towards portraits as human faces present such a unique challenge because they have such variations. It takes a lot of concentration and careful work to try lock down the right proportions as well as adding the right amount of depth and really trying to understand what makes a drawing look real. In just seven days I really seem to notice improvements in my own approaches and techniques so I want to keep the momentum going and improve even further. I'm getting out of the quick doodle mindset and really starting to devote real time into these relatively small pieces of work. This week's piece, which I'll go into in a moment, is the result of probably four or five hours work and it isn't even a third complete. Being patient and slowing down my drawing is teaching me to be more meticulous with the marks I make and really think before I put pen to paper. This week's piece is the unfinished result of a mini-project I'm taking part in with Luke whereby we select a theme every week and produce a piece in the style of our choosing. 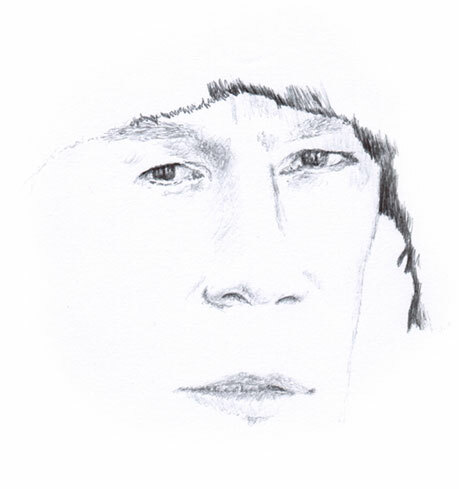 The theme here was Hats so instead of literally drawing a hat, I thought about people who are famous for hats and that led me to one clear choice, Jay Kay from Jamiroqui. It was going well until I realised I'd drawn the facial features a bit too big for the page and hadn't enough space to draw the hat! Rather than start all over again, I chose to turn it into a facial study piece and focus on trying to get the features as right as I could. Despite missing the hat, which was meant to be the key component of the piece, it still served the purpose as a means for me to improve my skills. It isn't quite perfect, the mouth is set too far from the nose and there are some other areas where I can find fault but as I do find them, I'll endeavour to not find them again in future pieces. I'm rather enjoying creating more realistic pieces, much more than I thought I would. I will likely continue with portraiture for a while yet but eventually, I'll start to take advantage of some of the wonderful landscapes and scenes my home offers. For now I'm just happy pushing my skills and seeing just how far I can go.